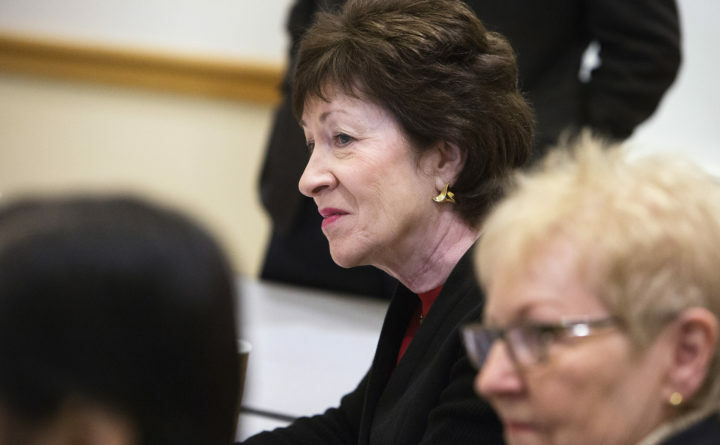 U.S. Sen. Susan Collins listens as families speak about the Alzheimer's disease drug trials their loved ones are in at Acadia Hospital in Bangor, March 23, 2016. Mary Dysart Hartt’s husband, Mike, was 58 when she began noticing things did not seem quite right. Daily tasks like running the tractor became challenging for him and fender benders became more frequent. Mary was familiar with the signs of Alzheimer’s since she was part of a family care team for her mother who was already living with dementia, but she was not familiar with early-onset cases. When Mike was 62, he was diagnosed with younger-onset Alzheimer’s. This inspiring couple from Hampden testified at a recent Aging Committee hearing I chaired that focused on advancements in both biomedical research and caregiving. Mary, accompanied by her husband, testified about how their life has “changed significantly” since his diagnosis. Mike was an avid outdoorsman, president of his family’s trucking business, Hartt Transportation, and the owner of a business that manufactured log homes. Over the past few years, however, the Hartts sold the farm where they had lived for nearly 40 years, and Mike has had to give up driving. Mary explained that although dementia has created unique challenges, she and her husband “continue to move forward with [their] life as best they can.” By working with their health care team and developing a care plan, they have made trips around the world, including to Alaska, Iceland, British Columbia, the Yukon and more. They have also worked to raise awareness and help others living with Alzheimer’s. Mary’s parents started the family-owned business Dysart’s, which is well-known to everyone in the Bangor area. It is now also famous for its “ Purpleberry Pie” — the color of Alzheimer’s advocacy — that has raised more than $25,000 for the Alzheimer’s Association, Maine chapter. Mary also plans to run her 41st marathon in Boston to raise money for Alzheimer’s research and help eliminate the stigma of this disease. In the fight against Alzheimer’s, people like Mary and Mike are the champions, and their advocacy has helped usher in an era of hope paired with action against this devastating disease. I held the hearing in conjunction with the Alzheimer’s Association’s annual advocacy forum, which brings more than 1,000 advocates from around the country to Washington, D.C. Their commitment underscores the ongoing need for federal legislation and policies that support families who are navigating Alzheimer’s. Alzheimer’s is not a normal part of aging, and we must accelerate efforts to improve treatment, find a means of preventing the disease, and one day discover a cure. As the founder of the Alzheimer’s Task Force in the Senate and a senior member of the Appropriations Committee, I recently helped secure a $425 million increase for Alzheimer’s research — the largest increase in history — bringing the total to $2.32 billion for this fiscal year. In March, I joined bipartisan groups in introducing the Younger-Onset Alzheimer’s Disease Act, which would allow Alzheimer’s patients younger than age 60 to access support programs and services, and the Improving HOPE for Alzheimer’s Act, which would expand Medicare beneficiaries’ access to a care planning session if they are diagnosed with Alzheimer’s. In addition, the Building Our Largest Dementia (BOLD) Infrastructure for Alzheimer’s Act I sponsored to create a public health infrastructure to combat Alzheimer’s disease was signed into law on Dec. 31, 2018. This law will promote early diagnosis and improve treatment and care for millions. It is a milestone toward building the public health infrastructure we need to better support individuals, families and communities. Tom O’Connor, a caregiver from Portland who also came to Washington for the advocacy forum, said this: “When we got the diagnosis, we were shocked and didn’t know where to start.” When he was referred to community partners, he received the information he needed and was able to put a plan in place to make the time ahead better for himself and for his wife, who is battling Alzheimer’s. From accelerating research to advancing care, we are making progress. While Alzheimer’s robs our loved ones of precious memories, I stand with such remarkable advocates as Mike and Mary Hartt and Tom O’Connor to do everything we can to one day make Alzheimer’s itself a memory.